Anyone interested in a small Springers only Evo tourney? Re: Anyone interested in a small Springers only Evo tourney? Oh, i guess there's no risk of me timing out on ZK 2v2. That actually wasn't intentional, but I figured that given time constraints, you would be ok with it. Isn't Anarchid like the second best EvoRTS player? Awesome tourney today! Thanks to everyone who played! Will be up on youtube sometime tonight. Biggest surprise to me was Anarchid beating out Godde in a 2-1. That was an amazing match! Watched one of the finals and I'm happy to see short games exist in evo (haven't played it much). 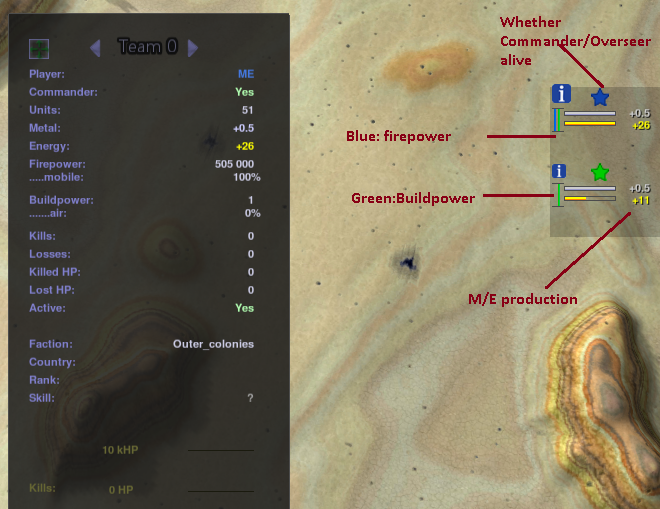 PS: I think you should make a spectator widget (something that shows off important player stats, like metal/energy, metal/energy inc, number of offensive units, etc.). A spec widget would make people like myself, and shadowfury very happy. Atm we usually go off of the player list in the bottom right. Unfortunately it isn't precise enough for evo, so I generally have to make guesstimations based upon what I see. An evo game between good players usually won't last over 15 minutes. Normally you can click on star to zoom in on Commander/Overseer, but it doesn't work well in evo because of the camera mode used. It seems to be a "free" camara mode, the "height" parameter is nil. Anyone knows any more about those camera modes? Mainly because it isn't chilified which makes it look kinda ugly, and frankly, it's huge. When not expanded, because it isn't chili, it totally doesn't fit and stands out like a sore thumb. The large info panels cannot be compared side by side. Only one is shown at a single time so without a lot of oh and umm, it's nearly impossible to do comparisons on the fly. The collapsed things has the same information as the big window, onkly not in numbers and text. I guess it doesn't fit that well with chili, but it's open source and whoever wants to can chilify it.